This is the third edition of CAN/CSA-C22.2 No. 60601-1. 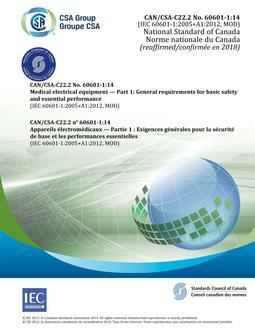 This International Standard applies to the BASIC SAFETY and ESSENTIAL PERFORMANCE of MEDICAL ELECTRICAL EQUIPMENT and MEDICAL ELECTRICAL SYSTEMS, hereafter referred to as ME EQUIPMENT and ME SYSTEMS. If a clause or subclause is specifically intended to be applicable to ME EQUIPMENT only, or to ME SYSTEMS only, the title and content of that clause or subclause will say so. If that is not the case, the clause or subclause applies both to ME EQUIPMENT and to ME SYSTEMS, as relevant. HAZARDS inherent in the intended physiological function of ME EQUIPMENT or ME SYSTEMS within the scope of this standard are not covered by specific requirements in this standard except in 7.2.13 and 8.4.1. This Standard can also be applied to equipment used for compensation or alleviation of disease, injury or disability. In vitro diagnostic equipment that does not fall within the definition of ME EQUIPMENT is covered by the IEC 61010 series 2). This Standard does not apply to the implantable parts of active implantable medical devices covered by ISO 14708-1 3). The object of this standard is to specify general requirements and to serve as the basis for particular standards. In the IEC 60601 series, collateral standards specify general requirements for BASIC SAFETY and ESSENTIAL PERFORMANCE applicable to a subgroup of ME EQUIPMENT (e.g. radiological equipment) a specific characteristic of all ME EQUIPMENT not fully addressed in this standard.